Following his resignation, members of the Friends present John Goldsmith, Curator of the Cromwell Museum between 1985 and 2014, with two Commonwealth coins. Since January 2014, the Friends of the Cromwell Museum have led the campaign to keep the Cromwell Museum open, following Cambridgeshire County Council’s announced intention to withdraw funding as from April 2015. The campaign has attracted local, national, and international interest. Just six weeks in, there was enough local support, through a 4000-strong petition, for the issue to be raised at a significant County Council meeting in February 2014. The petition asked for the County Council to continue funding the Museum until a viable alternative model had been put in place. Subsequent to this meeting, the County Council deferred its funding withdrawal – but only for one year. A Consultant’s report recommended setting up an independent Trust and Huntingdon Town Council expressed interest in taking the building over from the County Council. Members of the Friends have addressed many Committee and sub-Committee meetings during the year. A viable future for the Museum is far from assured. Two key posts – a ‘Project Officer’, to help the transition from County Council ownership to a new Trust, and a Chair of Trustees – are still to be filled. Huntingdon Town Council are in ongoing discussions with the County Council about the terms of any transfer and the costs of any required refurbishment of the building which, according to a survey, may be of the order of fifty thousand pounds. Despite assurances from Cambridgeshire County Council staff, the Friends have seen little to allay their ongoing concerns that the Museum will have made a successful transition to a new Trust by the time the money runs out in April 2016. In a presentation to Cambridgeshire County Council’s Highways and Community Infrastructure sub-committee in December 2014, the Friends reiterated the strength of local feeling about the Museum’s future, stating that “the four thousand or so of your citizens who signed a petition expect the County Council to have a duty of care to the treasure that is the Cromwell Museum and its assets and to nurture the new Trust and support its viability.” The Friends argued that the Council may well end up meeting its resource savings, but could cast adrift a barely set-up Trust, which was poorly supported, staffed and funded, and with no chances of survival. Huntingdon, the County, and Cromwell deserve better than that. The Friends have welcomed the supportive interest shown by Huntingdon’s local MP, Mr Jonathan Djanogly, throughout the campaign. Sadly, they also lost a tireless servant of the Museum when John Goldsmith, the Museum’s Curator since 1985, resigned late last year, citing concerns over the level of support the Council was offering the Museum in its move to a trust. 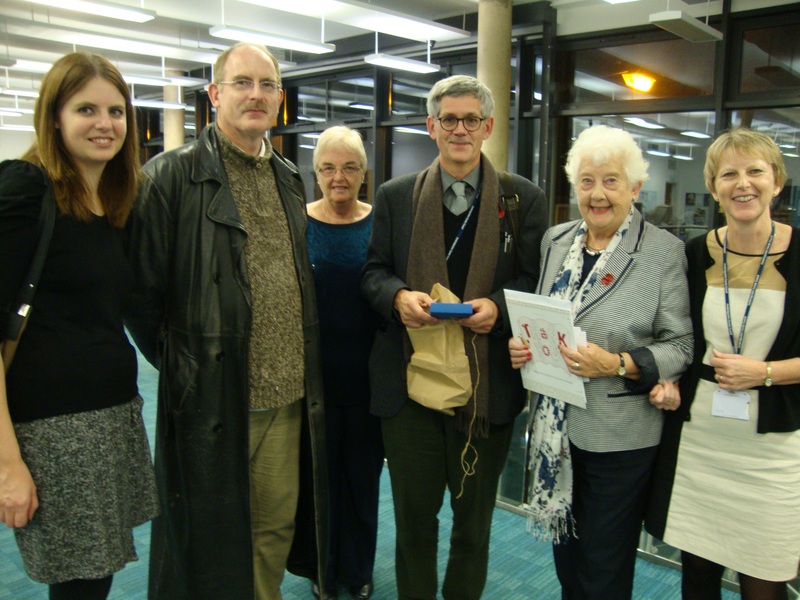 Before the Cromwell Annual Lecture in Huntingdon last November, as a token of their gratitude, the Friends presented John with two silver coins of the period – a Charles 1st half groat and a Commonwealth penny. This entry was posted in Uncategorized on January 30, 2015 by savethecromwellmuseum.